Yesterday I messaged Unique Vintage, who sells the city hall dress I loved, about it's backorder status and received no reply but an auto-generated response. I checked the site again today before sending them another message to only find that the dress is now on backorder until the middle of June. WTF! I was trying to get the dress for mid-May not June. This led me to go through a spiral of panic looking for a dress that could take the place of this dress. I began at Modcloth again as their prices tend to be easy on the wallet. 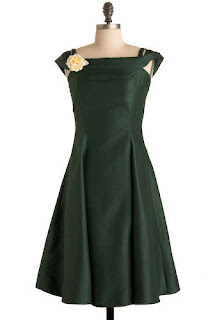 The first dress I found, named "Limerick Lass", had a splash of color with green trim. It also has this scarf that can be tied around the waist or neck. But sadly this dress would be too similar to my September wedding dress. It's also white not ivory so it would conflict with the vintage hat. And I don't believe it came in a size big enough for me. Yet still, I was freaked out about the possibility of our photographer not having time in June for the city hall affair and the possibility of needing to find the dress in the next 2 weeks. In a tissy of fear, I twittered Miss Penguin from Weddingbee asking her if it was White House Black Market that she had twittered about having an affordable wedding dress weeks back. She came through quickly with quite a few ideas and after seeing my vintage hat led me to Anthropologie (No I'm not talking the science but the store). 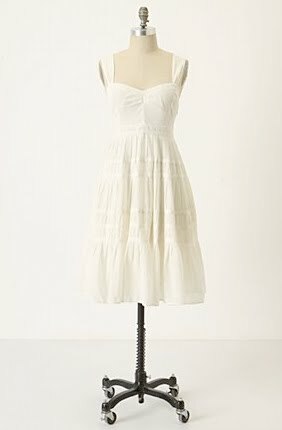 Luckily for me, one of the upscale suburbs in Pgh actually has an Anthropologie store making it easier to try on dresses and not have to deal with shipping back! Miss Penguin suggested the "Camillia", which is a simple dress that would look good with the hat. It's off white/ivory and black so that's a win! 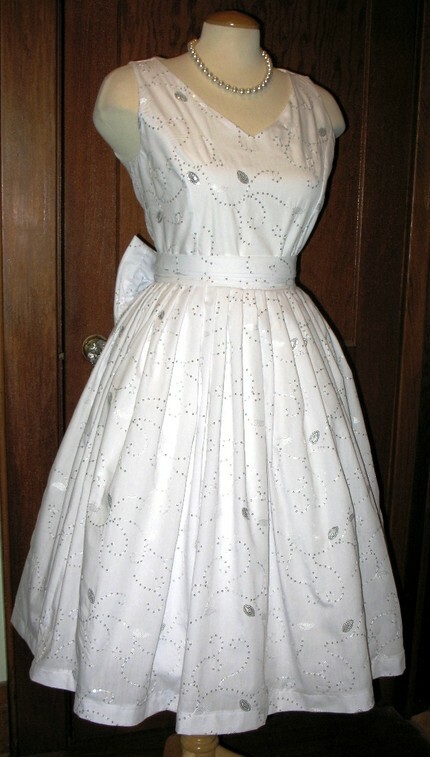 It also sports a slightly vintage look by featuring cotton eyelet fabric. The next dress I found was the "Things and Joys" dress in cream. 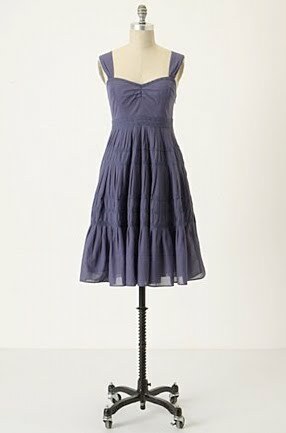 I first spotted the dress in blue and thought the style was appealing. Upon realizing it also comes in cream, the dress instantly went on the "to try" list. 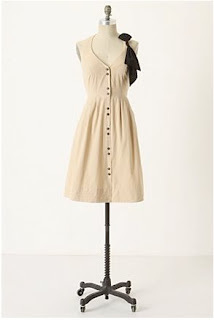 =) It a nice loose dress that might do Ok with the hat. 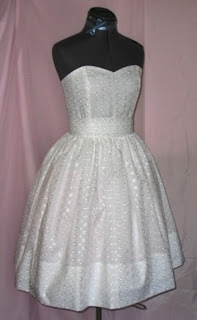 Digging deeper, I came across the "In A Twinkling Dress" and found myself thinking that would fit the hat quite well! 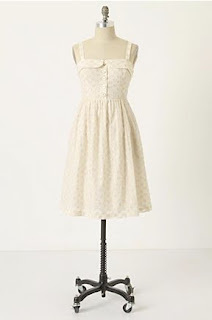 Although it doesn't have the dressy sass and style as other dresses I had seen, it would work. The final dress at Anthropologie that caught my eye was the "Sure Lock Dress". Hubs finds it hillarious as he reads it as Sherlock (aka Sherlock Holmes). We both agree that the style of dress would be quite nice with the hat and smooth lines to go with his Class A's. Hopefully the black bow is removable as it might conflict with the black on the vintage hat/fascinator I have. 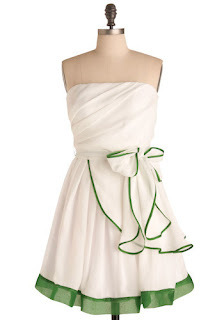 Anybody else out there have their ideas of the perfect dress destroyed by backorders and deadlines?